I happened to schedule my return trip to South Africa during the U-18 National Championship Tournament, probably the biggest event in South African basketball at the moment due to its complete sponsorship by Engen and its use as the trials for selection to the U-18 National Team. In a country where many players play barefoot outdoors and uniforms and balls are precious commodities, Engen supplies each participant at the U-18 Tournament with a ball, a track suit and a brand new uniform, though the uniform must be returned upon completion of the competition. For many of the players, the ball becomes a cherished item not because it symbolizes their time at the tourney, but because they become one of the few, if not the only one, with a ball in their neighborhood and the tracksuit is worn with pride until it is threadbare. After the fifteen-hour bus ride from Cape Town to Bloemfontein in the Free State, I served as the Technical Director for the Western Cape Boys and Girls Teams. While I did the best I could to offer some technical knowledge to the teams, including a late night outdoor practice on a moonlit court where I attempted to teach the girls team how to play man-to-man defense the night before their semifinal game, I again managed to take more away from the experience than I could ever hope to teach. I witnessed a coaching staff implement and carry out a flawless plan throughout the week that helped the third most talented team win the National Championship, while also learning to greet people in Zulu, Xhosa and Afrikaans, thanks in part to some of the kids from the local township in the stands and some of the players on the girls team. From its arrival, Head Coach Craig Daniels orchestrated the Western Cape boys team perfectly. Every night ended with a team meeting (unless they played a late game, in which case the next day would begin with a team meeting) and began with a light fifteen minute run at 6:00 AM. The team curfew was set at 10:00 PM and nobody on the team even considered breaking the rules. These morning jogs instilled a discipline that translated to the court, where Western Cape played as one unit, with one purpose. After allowing two leads to slip away on the first day of competition, resulting in narrow wins over Mpumalanga (72-68) and Free State (74-69), Daniels said, I never felt in danger of losing those games. He knew his players and he believed in his system. Results were of secondary importance to him, as he had the championship in the back of his mind. He wanted to see improvement, and he did not want his team to peak too early. He wanted competitive games to prepare his team for tougher games in the tournament, and he was not concerned by his teams inability to hold a lead. He did not yell or throw tantrums, but calmly addressed his team and never lost his cool or patience on the sideline. He kept his second best player on the bench for the entire second half of one game after he was called for a technical foul. While the team fought back in the closing minutes, Daniels remained steadfast and taught this player the importance of the team and taking care of business; nobody was above the rules. The daily team meetings propelled Western Cape to the championship. Here, coaches did not tell players their mistakes; rather, players and coaches discussed the previous games and learned from them. This was not a one-way lecture, but a discussion moderated by the head coach. The players did most of the talking, discussing changes they needed to make in their own game and as a team. They found most of the answers on their own, and relied on their coaches for only a small bit of technical adjustments. The meetings ended with Daniels leaving the team with a bit of motivation for the upcoming games. The championship was always the unspoken goal, but it was not actually stated until the team won its third game of the tournament against Northern Cape, an 80-35 thrashing. This victory assured Western Cape of a spot in the semi-finals, and the possibilities began to take shape, though many outsiders had failed to take notice. Western Cape ran nothing complex offensively and played only man-to-man defense. While this lack of sophistication prompted one coach (who fell to Western Cape twice) to criticize Daniels for his lack of coaching ability, it is Daniels confidence in his players borne of their development in the Western Cape Basketball Academy that propelled Western Cape to the championship. While other teams concerned themselves with fancy moves and 2-3 zone defenses, Daniels had his team focused on tight man-to-man defense and a basic 4 out-1 in offense. Before the first meeting with Kwazulu-Natal, the Championship goal began to take shape. Players were made aware of the opportunity to do something special and to be champions. Their resolve tightened, and their game improved. Excuses-the floor, the refs, etc-were eliminated, and winning became the spoken goal. Players made sacrifices, giving themselves up for the good of the team, as the rotation slimmed to seven men. Even the starting point guard had to resign himself to long stretches on the bench, as his back-up made tremendous strides running the team offensively and controlling the opponents point guard defensively. This selfless team approach also led to a change in style of play, as Western Cape attempted to slow the game, avoiding the track meet style preferred by the other eight provinces. Western Cape defeated KZN 68-63 in a game that was not that close in what amounted to a preview of the final. Western Cape disposed of Limpopo 100-75 in the semi-final in a game that was never in question, setting up a rematch with KZN. The team walked into the gym confidently and prepared as they had for every other game. Lyle and Godfrey Koti, the teams leaders, suffered from a little nervousness as the realization of their dream neared. To come so far and get so close would not suffice; they were determined to win. KZN opened in a gimmick triangle-and-two defense, essentially triple teaming Godfrey inside and guarding the two shooters one-on-one on the perimeter. They dared the starting PG and power forward to beat them from the perimeter, and jumped out to an 11-1 lead. The backup PG attacked the basket, and took some pressure off of the other players as Western Cape quickly closed the gap and trailed 30-29 at half. There was confidence in the Western Cape locker room as KZN has tried everything in the first half and still managed only a one-point lead. Western Cape realized the championship was in hand and second half execution would assure the victory. With 7:00 minutes to play and KZN leading by one, Western Capes Godfrey Koti, the MVP, fouled out, much to the delight of KZNs bench and coach. The remainder of the game was a battle, with Western Cape trying to do the unthinkable and win the game without the most talented player in the tournament on the floor. While Koti covered his head with a towel on the bench, Daniels called a timeout to set-up the plan for the last two minutes. Western Capes defense stymied the KZN perimeter players and shut down the KZN offense. Kyle Grey, the back-up center, scored the winning basket off an offensive rebound, and then blocked a desperation three point shot at the buzzer, as Western Cape claimed the championship 56-53. As the team danced and celebrated on the floor, Daniels self-effacingly answered questions for the national basketball show, In The Zone. Always modest, he credited the players attitudes and desire. It was clear, however, that Daniels positive sideline demeanor calmed the team and gave each player confidence, as there was never a knee-jerk substitution or need for a player to look over his shoulder to see if he would be exiting the game after a poor play. The players were free to play their game, and the system befitted the talents of this team. The daily meetings developed a strong mental approach and a closeness amongst the team and nothing distracted the players and the staff from their goal, the championship. Unfortunately for the Western Cape, the Girls fell one game short of the final, losing in an overtime thriller to the eventual champion Limpopo. In the most exciting game of the tournament, Western Cape overcame a lackluster first half and a sixteen point fourth quarter deficit to send the game into overtime. The crowd came to life, everyone stood and cheered and the environment in the gymnasium was electric. Western Cape exhausted itself in the comeback, but still had a chance to win the game at the end of regulation and then took the early lead, its first lead of the game, in overtime. However, after two players fouled out and one was carried off on a stretcher (though no foul was called), the team lost its leadership and momentum and the subs were cold as they had seen little time in the entire second half. Western Cape lost the game and the championship dream, but they gained the respect of everyone in the stands because of their tenacity and ability to overcome adversity and hot big shot after big shot. After returning to Cape Town, I spent most of my coaching time working with a friend training for the National Team and also coaching the Montana Vikings, one of the best top to bottom clubs in Cape Town. There I worked with the U-16s, U-18s and Men's teams, and even coached the U-18s and Men's Teams to victory over the Whoop Squad in a friendly scrimmage. My last clinic was a three hour advanced perimeter clinic for six 18 year olds that play in the First Division. The clinic was led by the MVP of the U-18 Tournament. I also distributed uniforms donated by the Monterey Park Heat, coaching books donated by Basketball Sense and my own coaching handbook. In May 2001, I was fortunate to join three other coaches for a Coaches' Tour in Cape Town, South Africa. The article below tells a little about the trip and also shares information about the Ambassador 2002 trip. 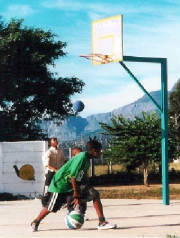 In May 2001, I was part of a Coaches' Tour organized by Hoops 4 Hope and sponsored by Strobe Communications that traveled to Cape Town, South Africa to conduct a two-day Coaches' Clinic for the Western Cape Basketball Association and also a number of development clinics in and around cape Town. My fellow coaches were: Sean McDonnell, Head Men's Coach, Hiram College; Andrew Miller, Assistant Men's Coach, Hiram College and a H4H Board member; and Will Robinson, a high school coach from Virgina who also coached the USA Junior National Team to the Gold Medal in France last summer. In Cape Town, we worked with Mark Crandall, founder of Hoops 4 Hope and Thierry Kita, Head Coach at Cape Technikon and Assistant Men's Coach of the South African National Team. In addition to our clinics, I was able to lead a few practices with South African First Division teams. I worked with the Montana Vikings and the Cape Tech Men's and Women's teams. I probably enjoyed these experiences the most because of the respct I have for Kita and Craig Daniels, the coach of the Vikings. 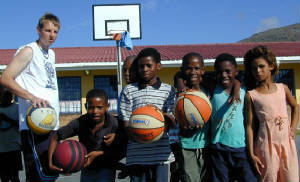 One of the greatest hindrances to the development of basketball in South Africa is coaches' resources. They have no books, newsletters, etc. They get all their information from the internet, or by staying awake late at night to watch NBA games if they are lucky enough to have satellite or find a bar showing the games at 3:00 AM. I have compiled a handbook of coaching tidbits to send to coaches and the Western Cape Basketball Association. To help defray these costs, I will make these booklets available to any coach who would like one. They are over forty pages and filled with quotes, drills, persepctives and teaching points. There are over 25 copies in circulation in Cape Town so far, from the SA Men's National Coach to two 17 year old girls who coach the U16 team at their club. The handbook includes sections on: Individual Offensive Moves, Individual Offensive Principles, 17 Tips for Attacking Zone Defense, Ball Handling, Shooting, Transition Game, Passing, Rebounding, Post Play, Defense, Building the "Gator Trap" Press (man-to-man trap) and an individual perimeter player workout as well as over 60 pertinent quotes from leading coaches and advice on coaching from Jimmy V, Bear Bryant and Steve Spurrier.